Kalimpong three times MLA Gaulan Lepcha and Dhendup Bhutia who recently tendered his resignation from GJMM party along with 11 other have joined the ruling TMC party. All have joined TMC at a program held at Kolkata . 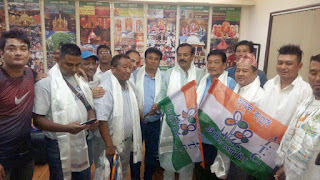 Arup Biswas PWD minister gave the TMC Flag to all. Dhendup Bhutia told we have joined the ruling party after laying 5 demands. He said the demand include opening of Jalepla Pass, improving Traffic system of Kalimpong, Sewargae line system of Kalimpong, Water Problem of Kalimpong and help to improve sports in Hills. The state has assured of positive assurance to solve all these problem after which we all joined the party informed Bhutia. He said we have decided to join TMC directly as all local parties of hills have to go to state for anything. He said we will built the party strongly so that our party wins the upcoming municipality election. Kalimpong three times MLA Gaulan Lepcha was MLA During GNLF regime and later joined GJM after 2011 . He was not active in GJM but now decided to Join TMC. The 36 constituency GJYM Secretary Sonam Tamang too joined TMC in the same program. Meanwhile GJMM today expelled Sonam Tamang and replace Bivet Subba as new 36 constituency GJYM Secretary. 0 Respones to "Dhendup Bhutia , Gaulan Lepcha and 11 others joins TMC"